Laird Mention, our enigmatic narrator, is leaving an asylum where he has been treated for schizophrenia among other, darker things he doesn’t choose to share. His journey is deep into the forest where Remo, his uncle, has agreed to let him spend a summer forgetting. Only Remo’s eccentric personality and insistence on protecting Woman Lake from all intruders, even if he has to kill, makes ugly questions bob to the surface, and soon Laird is not only remembering everything, but discovering new betrayals. Beast Rising, an ancient horror novel with a suitably 80s cover and wrinkled, yellow pages, was in a box of eBay finds during my massive spending spree (come on – 70 horror books for only $30 dollars – you would so do it too.) I liked the old school style of the novel, the back with its tremulous hints, the cover with its smearing serpent and overdone font style. Remembering all my favorite horror movies from the 80s, I dove into this blast from the past only to be disappointed by the very vagueness of a story which seeks atmosphere above revelation to its own demise. While Laird reveals, as he bumps along a rutted trail in his old Ford, that he has come from an asylum and has schizophrenia, the reader is instantly captivated. His hints of other matters that occurred before the asylum intrigue us more. What is his dark secret? What’s haunting him? How, with schizophrenia, has he been released, and how will this mental turmoil rear its head again at the suggestive site of Remo’s lake? The questions are soon set aside when Laird stumbles onto shotgun toting Remo, an overdramatic entrance of the semi-villain/semi-hero of the tale. Soon Laird and Remo are on a drunken binge, allowing readers to discover that Laird was a recovering alcoholic soon pulled back into the clutches of an intoxicated world. Indeed everyone in town, and I do mean everyone (including the one inept sheriff), are three sheets to the wind around the clock, stumbling into each other, downing beer after beer, and still oddly able to converse, sometimes philosophically. The soused town buzzing with heat in the middle of a draught that leaves dead fish basking in the sun beside the dwindling waters of Woman Lake is atmospheric, but not captivating. We feel the constant drunkenness, we feel the heat, and Billi’s roadhouse bar, and the drunkenness. Did I mention that everyone is always drunk, all the time, on every page? Conveniently, Laird’s mental illness doesn’t seem to cause him any problem at all and after so casually introducing schizophrenia, he casually drops it again until the conclusion of the tale where readers get it slammed between our collective eyes like an axe. For a novel in love with subtly, this is a big flaw. When Laird witnesses mysterious drownings in the lake, he remains oddly emotionless although inquisitive. We are supposed to intuite that his morals are piqued and he must protect people or find the answer, but it never comes off that way. His beer infused memories and thoughts, despite the narrative’s best efforts to draw correlations, cause him to come off as a static, stagnant hero. When a girl is snatched from the lake right in front of him, he makes no attempt to even save her. He doesn’t even question himself, leaving readers to wonder if he really is any better than Remo who admits to living for the selfish child inside. Meanwhile, The Gilgamesh is continually mentioned as is Remo’s obsession with it and creepy insistence that Laird read the ancient narrative. Remo even has some drunken musings about it. Ultimately, however, the tension awakened by bringing in this ancient narrative dissipates when readers are lead to realize that it means nothing to the story – or if it does it’s simply too subtle to categorize. The beastie itself is mostly a suspicion, hidden in the shadows and the fog, dragging innocents down to watery graves. The turn in the conclusion, reading how readers are to feel about the beast, is quite interesting and well done (and effective), even though the monster of the piece doesn’t make that many appearances. I’ve always been one for atmosphere and tension over gore and didn’t mind the absence of the beast so much as the unsympathetic nature of the protagonist who never truly seemed like a real person to me or reacted in any way I could relate to or even find interesting. Add to this a narrative that, while dreamily written, often gets readers confused about who is speaking and what is happening, and you mostly have a recipe for a fantastic story idea that remains skeletal and never fleshed out. 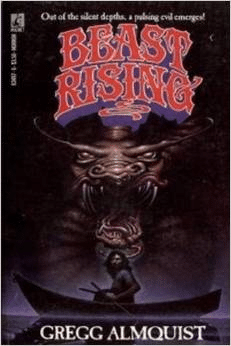 Ultimately, Beast Rising with its surrealistic atmosphere and intriguing idea is another novel that presents great intentions and even the bones of a stellar story but doesn’t live up to the promise. Not recommended.